On August 26, 1989, Voyager 2 hurtled past Neptune's big moon Triton, turning what for the human mind had been a point of light in telescopic photographs into a real place. Voyager 2 showed us a world with a thin atmosphere just thick enough to support faint clouds and hazes, a bright polar cap (found in later analysis to be dotted with active geysers), and tantalizing surface features that were described using descriptive terms such as "cantaloupe terrain," a name based solely on appearance because it was unlike anything seen before and afforded us no immediate explanation as to its origin. Voyager 2 acquired the images for this high-resolution mosaic of Triton on August 25, 1989. The south pole is at the right; several of Triton's famous south polar geysers are visible. Toward the equator at right, Triton is covered with a strange "cantaloupe terrain". The images Voyager took during the near-encounter portion of its approach mapped most of the visible area with ground resolution of a kilometer or two, with spots being imaged at up to 450 meters per pixel. Such a result was not supposed to be possible from Voyager 2. According to predictions made in the early 1980s, things didn't look too good even if Voyager survived all the way out to Neptune (eight years beyond its design lifetime). The imaging system utilized an already-antique vidicon detector that was not designed to be used beyond Saturn. This, combined with low light levels due to the spacecraft's ever-growing distance from the Sun and rapid spacecraft motion, was expected to produce images so badly smeared and/or underexposed that effective resolution of any images of Neptune and its moons would be no better than 10 kilometers. Nature helped, though. 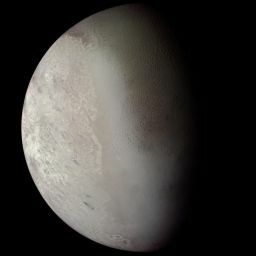 Triton's diameter was thought to be as large as 5,000 kilometers in the early 1980s, but as measurements improved, it turned out to be about 2,700 kilometers. Triton also turned out to be one of the most reflective objects in the solar system (which is what fooled earlier astronomers who had based their diameter estimates on the idea that Triton would not be very reflective). This meant that it was a brighter target to photograph than had been expected, meaning that shorter exposures could be used. Shorter exposures certainly helped Voyager imaging in the early near-encounter phase, but not near closest approach, where the apparent motion of Triton relative to Voyager was at its most extreme. To combat this, the imaging team developed an ingenious technique (first pioneered during the Rhea flyby while in the Saturnian system and heavily utilized during the close flyby of Uranus's diminutive moon Miranda) that involved rotating the spacecraft against the direction of spacecraft motion in order to compensate for the smearing. As a result, we have far better coverage of Triton than mission planners could have dreamed. However, there was another limitation. Being farther from Earth than ever before, Voyager could not return data at nearly the rate it could at Jupiter (although Deep Space Network upgrades had allowed it to transmit about as quickly as it had from Uranus). For many of the near-encounter images, it had to rely on its tape recorder, which could only hold about three dozen images, although some rudimentary compression techniques improved this a little. Wisely, this limited resource was all used during the approach phase, when Voyager was looking at the mostly-lit side of Triton. Voyager 2 took this photo of a crescent-phase Triton after its closest approach on August 26, 1989, from a distance of 252,000 kilometers. After closest approach, Voyager looked back at Triton's thin crescent. Its tape recorder full, it couldn't take images at nearly the rate it had on approach. Also, since it had its precious approach data stored on its tape recorder, no one wanted to risk something going wrong by rolling the spacecraft again. At about 70,000 kilometers' distance, Voyager began to snap images with its wide angle camera, which was less affected by spacecraft motion due to its lower resolution and lower required exposure times. To the astonishment of scientists watching the images come in, in addition to limb hazes, many discrete clouds were visible (now thought to be more geyser plumes blowing in Triton's frigid winds). The crescent is so thin that little else can be identified. At 252,000 kilometers, a single wide angle image was taken, with ground resolution of about 2.3 kilometers. This image, the only one taken in which Triton was still too large to sit in the frame, was intentionally underexposed in order to compensate for spacecraft motion. Then, at about 400,000 kilometers, another set of images was taken, this time with a ground resolution of about 4 kilometers per pixel and utilizing several color filters. 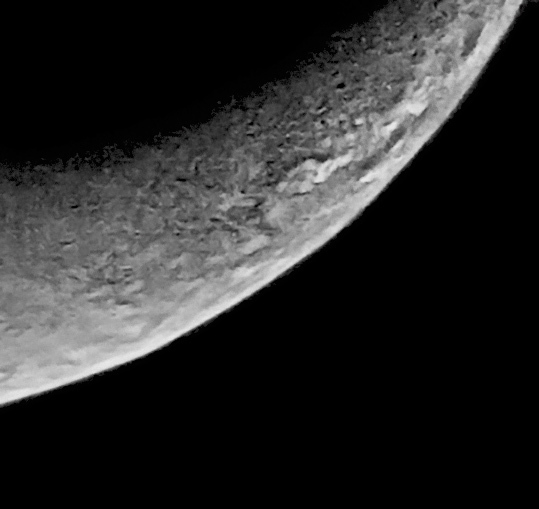 The images are of good quality, with Triton still capable of filling about two thirds of the length of the frame (although the upper tip of the crescent was clipped due to the camera pointing being a bit off). A final set of two images, taken from 720,000 kilometers at a resolution of about 6.7 kilometers per pixel, captured the elusive upper tip of the crescent. Most of the work done with these images over the past two decades focused on the geyser plumes and the resulting clouds that are clearly visible. Triton has very subdued topography and most of the images are at least somewhat underexposed, making the surface features appear as little more than a tantalizing mottled array of bright and dark spots. For years, I have toyed with the image set, trying to pull out any surface features that might be identifiable. Through a combination of stacking, filtering, and other enhancements, I was able to pull out some features that were clearly visible in multiple images. The highest resolution images show terrain resembling the terrain Voyager identified during approach. There was a patch of the cantaloupe terrain, with its characteristic pitting, as well as some areas of smooth plains. Some areas, as on the approach hemisphere, were simply jumbled (at least on this scale). Phil Stooke used the processed images to map the distribution of different terrain types. Some faint tectonic features were visible, possibly extensions of those seen on approach. Perhaps the most significant thing is what Voyager 2 didn't see: impact craters. In the image set, there is not one clearly identifiable crater. There are a few features that might be impact craters, but they show little topography. 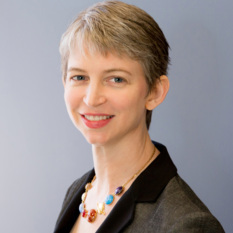 If they are craters, they have been heavily modified by internal processes. The images are of far better quality than our best imagery of the Uranian moons Oberon and Umbriel, and those worlds appeared peppered with craters. The fact that Triton is so smooth can fool the eye into thinking that the images are of poorer quality than they are. These images demonstrate that at least another chunk of Triton is similar to the section seen during approach. Examining these twenty-year-old images provides an opportunity to extend our coverage of a mysterious world that even for Hubble is only a few pixels across, and that we will still not be seeing close up again for at least another twenty years (and that's only if, at the next New Frontiers proposal opportunity, the "Argo" proposal is selected). In other words, now is the midpoint between flybys at best. Further analysis will hopefully allow better incorporation of this data into maps, allowing us to fully utilize the only coverage we have of this frigid ball of ice and rock at the edge of the Kuiper belt. 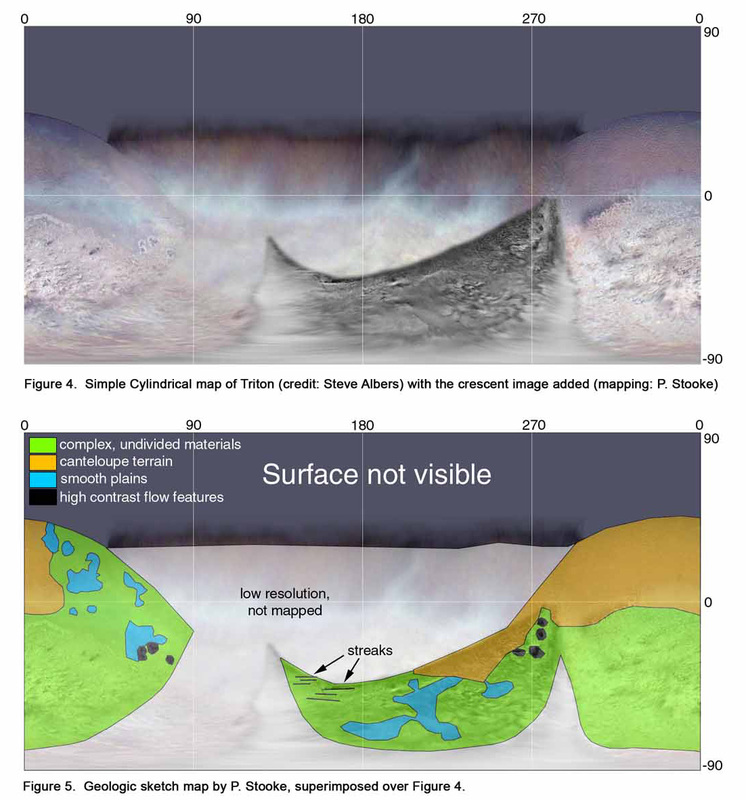 This map of the surface of Neptune's moon Triton has been enhanced by the inclusion of newly processed images taken by Voyager 2 as it receded from its encounter.